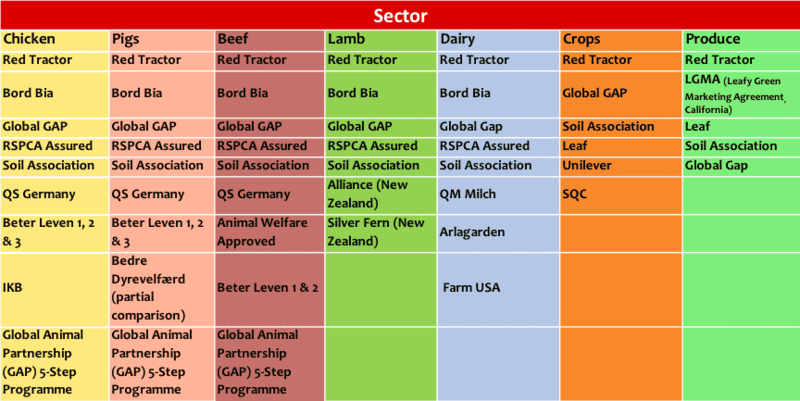 How does Red Tractor rank against other food assurance schemes? In the same week that the seventh Business Benchmark for Animal Welfare was launched, ranking the world's leading food producers for their animal welfare practices and with only one month left before the UK is set to leave the European Union, the UK's most widespread food assurance scheme held a seminar at the House of Lords to announce the work it has put into understanding its strengths and weaknesses compared with other assurance schemes. Led by Dr Johnathan Birnie who studied at the Agricultural Institute of Northern Ireland and Queens University, the research and benchmarking project revealed that Red Tractor is a leader in some areas, it is lagging behind in others, such as environmental protection and stewardship, and farmer health and safety. Red Tractor was found to be consistently world-leading in traceability and food safety. In food safety Red Tractor performs well against all other schemes. Especially noted is the provision of specific and detailed standards. Red Tractor performed very well in terms of staff training standards. However, Worker Welfare or the Ethical Treatment of agricultural workers is not well covered by nearly all farm assurance schemes across the globe and provision of significant development is required across all schemes including Red Tractor. In broiler chickens new enrichment standards are very robust and almost in line with the RSPCA (bales, perches and pecking objects). The Red Tractor Chicken Scheme is world-leading in terms of its whole assurance chain, ie, assured breeder farms, hatcheries, broiler farms, catching, transport and processing. Areas to consider for future standards development include: stocking density, lighting and genetics (slow growing breeds). The findings support Red Tractor’s planned development to cover specialist areas such as higher welfare, environmental enhancement and organic production. The International Benchmarking Study was announced at an event hosted by Baroness Lucy Neville-Rolfe at the House of Lords on Thursday 28th February 2019. Red Tractor is a world-leading farm and food assurance scheme that provides traceable and safe food for UK consumers. The Red Tractor logo can be found on millions of food items sold in supermarkets and restaurants across the country. "It’s an easy signpost for British consumers looking for food that they can trust," said Red Tractor in a news release.